The Olpe Eagles could be the underdog story of the 2018 football season. The Eagles enter Saturday’s Class 1A State title game with a 12-0 record and will be playing in their fourth state championship game and will look for their second state crown against reigning Class 2-1A state champion Smith Center. Olpe coach Chris Schmidt said he wants his kids to embrace this week and enjoy it. Smith Center enters Saturday’s contest with an 11-1 record, with its sole loss was to Phillipsburg. Coach Darren Sasse said it’s great to be back in the same scenario the Redmen were in a season ago. 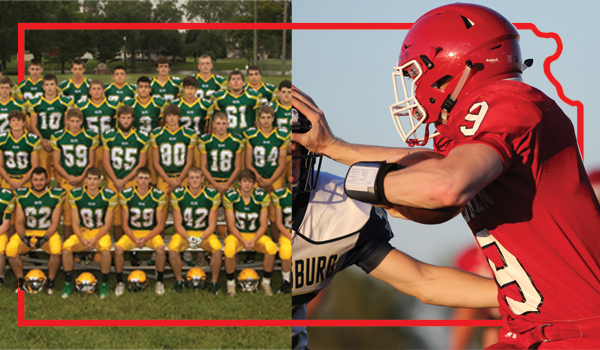 Olpe's early-season battles with Jackson Heights and Christ Prep have set the Eagles up for the likely challenge ahead with the Redmen. Olpe’s two closest games of the season came to Jackson Heights in week four and to Centralia in the sectional round by a combined four points. The Eagles are led by junior quarterback Colby Hoelting has thrown for 899 yards and 15 touchdowns. Sophomore Kynden Robert has been Olpe’s primary back after senior Blaine Hinrichs went down with an injury late in the season. Robert has rushed for 1,058 yards and six touchdowns. Hoelting’s leading receiver is his brother, Camden, who has reeled in 315 yards and six scores. Through 12 games, the Olpe defense has allowed fewer than six points on average. Sasse said it all starts up front for the Redmen. Smith Center’s averaging 40.8 points per game on offense and will run out of a powerful wishbone offense that opponents have struggled to stop. Hesston Maxwell (617 rushing yards), Ethan Peterson (1,184 rushing yards), Colby Benoit (1,162 rushing yards) and Trenton Colby (573 total yards) will all be threats coming out of the backfield for the Eagles’ defense. Sasse said it’ll be a challenge. Schmidt said it’ll be a tall task to stop the Redmen’s offense. Olpe will be looking for its first state title since 2014, while Smith Center will look for back-to-back state trophies. Kickoff is set for 1 p.m. Saturday at Lewis Field in Hays.